Elderly woman in Port Arthur takes breathing treatments. If anyone has any doubts about the GOP's plans for Social Security, their choice of Rep. Paul Ryan (R-Wis.) to succeed Rep. John Boehner (R-Ohio) as Speaker of the House should put those doubts to rest. Ryan was an outspoken, unabashed supporter of President George W. Bush's privatization plan. He continued to openly advocate for that dangerous idea long after the American people soundly rejected it. Privatization remains a terrible idea. But, even when Republicans controlled both Houses of Congress and the White House, in 2005, a newly elected president, George W. Bush, who pledged to spend his political capital on privatizing Social Security, couldn't enact it. The current fight is different. While Speaker Ryan and other Republican leaders may still want to privatize Social Security, they know better than to openly espouse it. Instead, they've pivoted to a dual strategy of fear mongering and chipping away at the system, darkly warning that the system will go broke unless benefits are cut. They are championing a variety of "reforms," such as drastically cutting middle class benefits and reducing the already inadequate cost of living adjustment that is intended to prevent benefits from eroding over time. These and other cuts cumulatively, and eventually, would dismantle Social Security brick by brick. "They rev up the base of the party, but if all you are doing is redistributing golden eggs and you've got a dead goose, you aren't going to get very far," he says. "That's what I worry about more than anything else." The discredited notion that Social Security is unaffordable increasingly fails to resonate with voters because it is simply wrong. Equally wrong is the idea that an expanded Social Security system somehow harms, rather than helps, growth. Anyone who is paying attention right now knows that our nation is facing a retirement income crisis -- not a Social Security crisis. In fact, expanding, not cutting, Social Security is by far the best solution to the economic insecurity with which people in this country are actually grappling. Numerous factors have conspired to create the U.S. retirement income crisis. The number of people with defined-benefit pensions has shrunk dramatically in the past three decades. Saving individually for retirement has never worked for the overwhelming majority of workers. Many people have not been able to rebuild their personal savings since the devastating Great Recession, when house prices and the value of 401(k) plans plummeted while unemployment soared. Flat middle-class wages are making it hard for most families to regain their economic footing, let alone save for retirement or even for more immediate needs. Communities of color experience these same challenges, and more. Long-standing economic insecurity has been deepened by racism. People of color have been discriminated against in a variety of ways that have kept them in low-paying, often physically demanding jobs without retirement and other benefits. Racist policing has produced mass incarceration, crippling the wage-earning capacities of too many young men and women of color who find themselves ensnared in the justice system. Meanwhile, single mothers of color continue to be targeted by lenders for abusive subprime mortgage loans and payday loans, making it ever harder for them to get ahead. The threat of old-age economic insecurity is particularly acute for women, especially women of color. The gender and gender-race wage gaps mean that women work a lifetime at unequal pay. Part of that unequal pay is the lack of deferred compensation in the form of employer-provided retirement income. Moreover, often overlooked is that, in addition to lower pay, women often have higher expenses than their male counterparts because they are more likely to have financial responsibility for housing, feeding, clothing, educating and providing health care for children, but less likely to have employer-provided benefits like health insurance. Because so few women have employer-provided retirement benefits or personal savings on which to rely, Social Security is disproportionately their sole source of income in old age. For 49 percent of never-married, divorced and widowed women aged 65 and older, Social Security comprises virtually all of their income. That is nearly one out of two single women! Despite this heavy reliance, women's Social Security benefits are considerably lower -- averaging less than $13,000 a year -- than their male counterparts. And because women, on average, live longer than men (two-thirds of Social Security beneficiaries age 85 and older are women), they rely on these benefits longer and are more hurt by their failure to keep pace with health care costs and other expenditures. Consequently, expanding, not cutting, Social Security is essential for women, especially women of color. A key expansion proposal is the caregiver credit. Currently, women (and men) who are forced to drop out of the paid workforce to care for children or other family members not only forego income now, they also are likely to receive lower Social Security benefits as a result of their time away from paid work. The caregiver credit would not help with the lost current earnings (though a refundable tax credit could help here). By providing some credit toward Social Security benefits, the caregiver credit would mean that the invaluable work of caregiving was at least recognized and implicitly compensated to some extent if and when Social Security benefits are paid as the result of old age, death, or disability. Other essential expansion proposals include across-the-board benefit increases, raising the minimum benefit, and enhancing widow(er)s' benefits to reduce the likelihood of the death of a partner forcing the survivor into poverty. Those who falsely claim that we can't afford to expand Social Security either don't know or don't want you to know the reality. We can -- indeed, we must -- increase Social Security's dedicated revenue. We are the wealthiest nation on Earth at the wealthiest moment in our history. We can easily afford an expanded Social Security if we require the wealthiest to pay their fair share. In addition to increasing the amount contributed to Social Security by the top one percent, we should more fairly distribute the productivity gains produced by all of us. As a first step, the federal minimum wage should be increased from its current poverty level of $7.25 per hour (and a scandalous $2.13 for tipped workers) to a living wage -- $15 an hour or higher. We should also ensure that workers up and down the income scale receive better wages. Perhaps the best way to do this is the way that it has happened historically -- protect and foster employees' ability to form unions and bargain collectively for higher pay and benefits. And we should enact effective policies for full employment, so that everyone who is able and willing to work and contribute has the opportunity. These strategies are good ideas in themselves. Moreover, taken cumulatively, they would produce resources for our Social Security system that would pay for benefit expansion while ensuring the actuarial soundness of the system for decades beyond its current status. Polls show that the public, including majorities of Republicans, Democrats and even Tea Party supporters, want to see improved benefits. The fairest way to spread the cost is to require the wealthiest among us to pay their fair share, which they are not doing now. What the public doesn't support is a so-called "balanced" package akin to the one proposed a few years ago by Erskine Bowles and Alan Simpson, the co-chairs of President Obama's doomed deficit commission. They sought to sell their proposal for a smorgasbord of Social Security benefit cuts by promising to take care of the "oldest old" and "poorest poor" and suggesting their cuts would only affect "higher" income seniors. But the vast majority of seniors are one serious illness, death of a spouse, or other life-changing incident away from poverty, and those "higher" income seniors overwhelmingly have incomes that are middle class or lower, as the following chart makes clear. Voters understand this reality all too well. Too many of today's workers--especially women-- believe that they will never be able to retire and maintain their standards of living. Too many must choose between paid work and caring for children and aging relatives, knowing the economic insecurity the latter choice brings. Social Security can and should be there for them. With Speaker Ryan at the helm of the House, we know that politicians in Washington will continue trying to undermine Social Security by stealthily advancing benefit cuts or preventing improvements that would increase the system's income. We will continue to fight those efforts, and we believe we will win. Because the good news is, people are no longer buying the tired old claim that Social Security is in trouble. 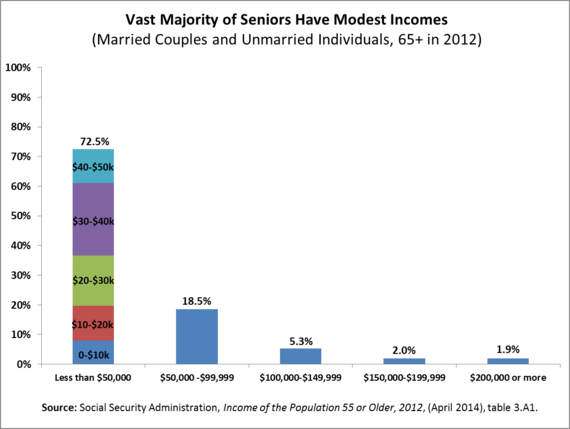 The real issue is the looming retirement income crisis, and Social Security is the answer. It is time to expand Social Security, not cut it.